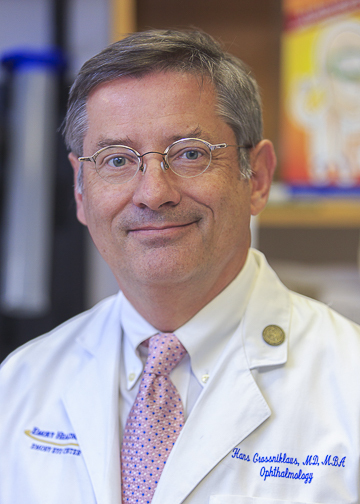 Dr. Grossniklaus was appointed interim vice chair of Emory Eye Center on March 14, 2016. He is the senior professor of ophthalmology, Department of Ophthalmology, Emory University School of Medicine. He is founding director of the Ocular Oncology and Pathology service and director of the L.F. Montgomery Laboratory. He is board certified in both ophthalmology and anatomic pathology. He has expertise in diagnostic ophthalmic pathology, ocular oncology and ophthalmic pathology research, including drug delivery. In 2017, under his directorship, the Montgomery Lab reached an accumulated 70,000 specimens evaluated since the 1940s, with Grossniklaus having signed out over 60,000 cases himself. Dr. Grossniklaus has over 500 publications in peer reviewed journals. He has written/co-written 25 book chapters and edited/co-edited 10 books/monographs. Diagnostic ophthalmic pathology includes surgical pathology of ocular and periocular tissue, including cornea, vitreous, retina, uvea, conjunctiva, eyelid, and orbit. Ocular oncology includes conjunctival, retinal, iris, ciliary body and choroidal tumors. He has expertise in translational research, having served as the director of the Submacular Surgery Trials (SST) Pathology Center and a clinical trial to treat patients with uveal melanoma. His clinical areas of interest are ocular oncology and ophthalmic pathology. His research areas of interest are treatment of primary ocular melanoma and retinoblastoma, molecular pathology of retinoblastoma, and control of metastatic melanoma from the eye to the liver. Dr. Grossniklaus regularly see patients with ocular malignancies, and he treats them with surgery, lasers and radiation therapy. Dr. Grossniklaus has received the Lifetime Achievement Award, Senior Achievement Award and two Secretariat Awards from the American Academy of Ophthalmology. In 2012 he was tapped as one of Emory University's eight Distinguished Teaching Scholars, its only School of Medicine designee. Grossniklaus, who also serves at Winship and is an investigator for NCI-institute ocular oncology grants, is executive vice president of the American Ophthalmological Society (AOS), past president of the American Association of Ophthalmic Oncologists and Pathologists (2012-2014) and past president of the American Ophthalmological Society (2013-2014). He received the Zimmerman Medal from the American Association of Ophthalmic Oncologists and Pathologists in 2012 for outstanding contributions to ophthalmic pathology. He delivered the Jackson Memorial Lecture to the American Academy of Ophthalmology in 2014. This is the most prestigious lecture in clinical ophthalmology in the United States. He was awarded the Life Achievement Award by the American Academy of Ophthalmology in 2015. Grossniklaus was tapped as an F1000 Faculty Member of the Year for 2011, an international honor for academic physicians. He received an Alcon Research Institute award for $100,000, given annually to six outstanding senior ophthalmic research scientists selected from a pool of 50 to 100 nominees. He is consistently ranked as a top doctor by U.S. News & World Report, where he ranks in the top 1% of doctors so listed. In April 2014, Dr. Grossniklaus was inaugurated into Academia Ophthalmologica Internationalis (AOI), the most prestigious academic ophthalmology society in the world. He delivered his inaugural address for AOI in Tokyo on April 2, 2014. Grossniklaus is editor of Pocket Guide to Ocular Oncology and Pathology (Springer), a handbook designed to serve as a reference on the clinical features and pathology of ocular tumors. Dr. Grossniklaus is founding co-editor of the the journal, Ocular Oncology and Pathology. He is also editor of Eye Pathology, An Illustrated Guide, a major textbook published by Springer in 2015. He is also editor in chief of the World Health Organization (WHO) book, Tumors of the Eye.